Heracleion ia a city much like Atlantis, submerged and swallowed by the Mediterranean sea for over 1200 years. 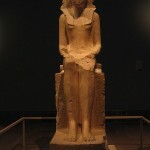 But archaeologists are now discovering amazing statues of Egyptian Gods and beautiful gold artifacts. The mysteries of this sunken city is truly being unraveled . . . From description published with video. Nearly 2,000 years ago, at a time when Egypt was under the control of the Roman Empire, a young woman with an elaborate hairstyle was laid to rest only yards away from a king’s pyramid, researchers report. She was 5 feet 2 inches in height, around age 20 when she died, and was buried in a decorated coffin whose face is gilded with gold. Anearby pyramid, at a site called Hawara, was built about 2 millennia before her lifetime. The location of her burial is known from archival notes. 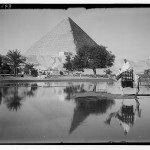 An ancient harbor on the Red Sea proves ancient Egyptians mastered oceangoing technology and launched a series of ambitious expeditions to far-off lands. (Atlanta) Six hours southeast of Atlanta off the Georgia coast on Sapelo Island, archaeologists have unearthed the remains of an ancient walled city which predates the construction of many of Egypt’s pyramids. Known as the Sapelo Shell Ring Complex, this ancient city was constructed around 2300 B.C. 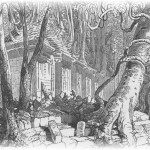 and featured three neighborhoods each surrounded by circular walls twenty feet in height constructed from tons of seashells. Some of the earliest pottery in North America was also found buried in the remains of this lost city. What if your telecom company tracked the websites you visit, the apps you use, the TV shows you watch, the stores you shop at and the restaurants you eat at, and then sold that information to advertisers? 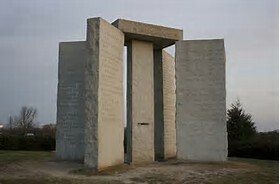 Wikipedia: The Georgia Guidestones is a granite monument erected in 1980 in Elbert County, Georgia, in the United States. A set of 10 guidelines is inscribed on the structure in eight modern languages, and a shorter message is inscribed at the top of the structure in four ancient language scripts: Babylonian, Classical Greek, Sanskrit, and Egyptian hieroglyphs. 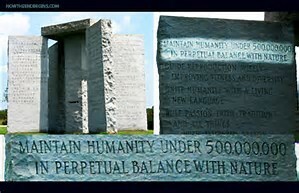 Exposing the “Satanic ten commandments” of the mysterious Georgia Guidestones monument, the goal of depopulation, State sponsored pandemics, and the Rockefeller Foundation’s vaccine agenda. 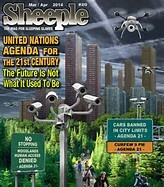 Image: Sheeple magazine by David Dees. Used under Fair Use protocol. THIS IS THE DIFFERENCE BETWEEN AGENDA 21 AND AGENDA 2030.